In my work I use abstraction to talk about our relationship with history, the environment and the human development of places and buildings over time. It is not necessary to know the ideas behind my work in order to appreciate the paintings in purely aesthetic terms, but I am interested in telling stories and expressing my observations, I'm not just making pretty patterns. Unifying the canvasses over the years is a linear structure that shows through in the texture of the paint as well as in the design; it all comes back to drawing. My aim is to produce an antidote to the slick digital and CGI images that surround us on screens everywhere. I like paintings with fingerprints and brush marks that look like they have been made by a human being rather than a computer programme. I love to see a trace of charcoal peeping through in works by Picasso or Matisse, revealing a change of mind - a thought process - that’s what thrills me about art and that is the spirit of what I try to do in my own work. 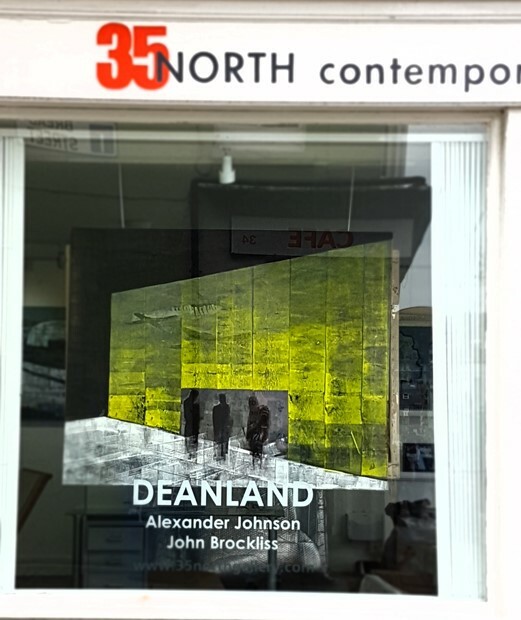 "DEANLAND EXHIBITION (Brighton, 9 June - 21 July 2018)"
2019 April/May: Farley Farmhouse Gallery & Lee Miller Archives, The Deanland Project (John Brockliss photographer) curated by Antony Penrose. 2018 November, Woolwich Print Fair, London. 2018 Glynde Place Chalkpit group exhibition. 2017 Rabley Drawing Centre touring exhibition. 2017 Towner Art Gallery Eastbourne, Five Silkscreens from the Reconnaissance series. 2017 National Original Print Exhibition, Bankside Gallery London. 2017 Reconnaissance at ATOM Gallery, London, solo exhibition of silkscreens on paper. 2016: Gallery 35 North, Brighton. Solo exhibition of new work. 2015: Club Abstract, at the Towner Gallery Eastbourne, Alexander Johnson talks on William Gear relating it back to his own work as an abstract artist. 2015 SEO: three pieces selected by The Towner Gallery, Eastbourne, July-September. 2015: LIFE IN ABSTRACT new work (solo exhibition) The Project Gallery, Arundel. 2011 - Pushing Print, The Margate Gallery, Kent. 2007 - Art/CLIC, Bankside Gallery, London. 2015 Inside Artists magazine, Issue 2.